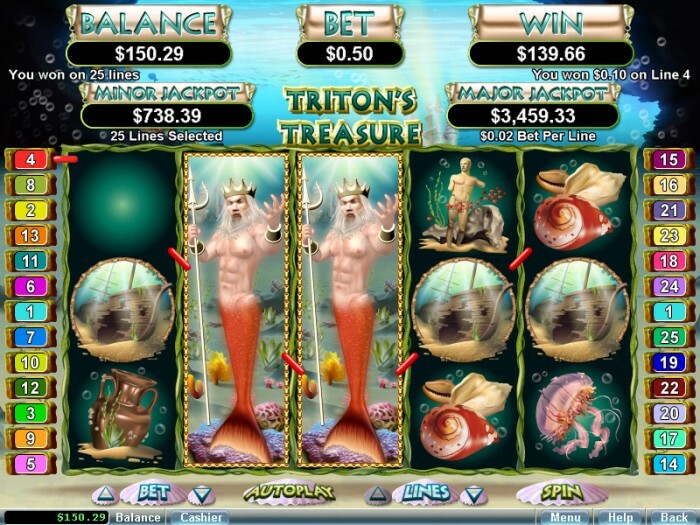 One of the most exciting slot games for today’s online casino players is Triton’s Treasure. Enjoy the graphics on the reels while spinning for the treasure of the king of the ocean depths. How easily will he give it up? The rules for the game are easy to understand to maximize the fun of this 25 payline game from Realtime Gaming. The most important step is wagering at least one coin for every payline. Two types of treasure, wealth from sunken ships and sea creatures, are identified by symbols on the machine’s 5 reels. Fish, Crab, Shells, Octopus and Jellyfish make up the creatures. Symbols of sunken treasure are Statue, Ship, Urn and Treasure Chest. Triton represents the wild symbol, while the scatter symbol is represented by the Mermaid. Pink shells add to the ocean floor setting by serving as buttons. Coin size starts at .01 and progresses to 5.00. A player could bet just .01 and play a single payline. That defeats the fun of playing for the fixed jackpot found in Triton’s Palace, so players typically spend at least 25 coins to cover all the paylines. Mighty rulers are capable of doing fantastic things. The animated Triton symbol appears only on reels 2, 3 and 4. It expands to cover all rows of the reel, where he raises his fist to release his trident’s bolts of lightning. The animated Mermaid scatter symbol is less bold, displaying bubbles dancing in the water and fish swimming in the background. Two or more Mermaid symbols anywhere on the reels provide scatter pay. Three or more scatters activate the free spin bonus of at least 5 spins with a 1X multiplier. Each Mermaid symbol that appears during the free spins provides a bonus pick. The player can select to increase the multiplier by 2X or add 5 extra free spins. As an additional bonus within the free play, 3 or more mermaids on the reel during the same spin add 5 extra spins. Music accompanies the special cards and the free spin feature. Two progressive randomly triggered jackpots add to Triton’s Treasure’s intrigue. They are referred to as the Major Jackpot and Minor Jackpot. Players can adjust the speed of the game and choose autoplay rather than repeatedly pushing the PLAY button. Triton’s Treasure earns 9.4 out of 10 rating. The best features are its easy to understand game play, colorful and imaginative graphics, and the interesting concept and theme. The player can set the number of automatic spins from the main screen, as well as select certain features that will end the autoplay. Common reasons to terminate autoplay include a change in the number of credits or lines played, or winning free games during play.